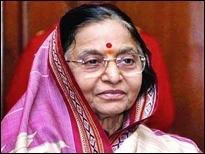 4Jan : President Pratibha Devisingh Patil asked IPS probationers to work with diligence, intelligence and devotion and to use the authority and power of the uniform to penalize law breakers. Interacting with the Probationers of the 61st Batch of the Indian Police Service who called on her at the Rashtrapati Bhavan, the President advised the officers to be a few steps ahead of law breakers, as in recent years there have been experiences where criminal elements have displayed the capacity to be skilled in technical areas. Patil said she was proud to see a large number of women officers in the batch. She said in the past women needed protection, but now they are protecting society. The group had 91 officers, of which 22 were lady officers, bringing with them the knowledge and experience from varied backgrounds, with some of them being qualified doctors, engineers and Information Technologists. The women officers of this IPS batch described their aspirations to the President, saying they would endeavour to uphold the Constitution and protect law and order. They said they would also strive to sensitize the police on important social issues, help the poor and be leaders, by having a vision. I m danish and i want to be an ips officer for decrease the corrouption and crime which is involve in india .so plz help me for making an ips.